Tonight we learned about the attributes of Musa (a) and Harun (a) and the different roles they played in leading the believers. The chapter spoke about the staff of Harun (a) flowering as a sign from Allah (s). My son said that if his staff flowered he would give it to me as a gift. I said that would be very sweet. 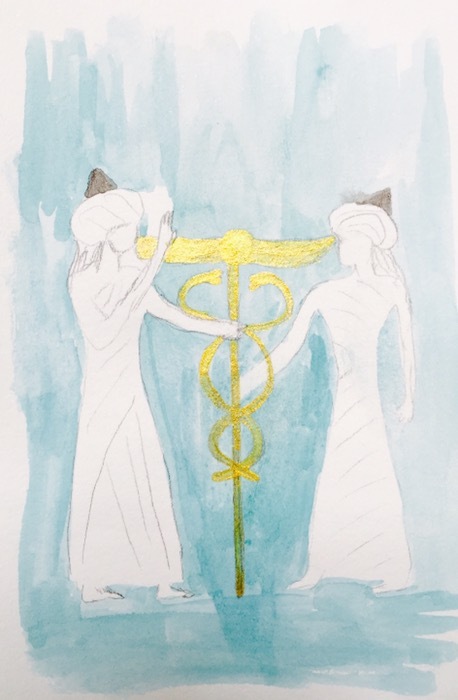 Image: for this image I have shown two figures for the two prophets holding a staff that is also a caduceus. Instead of a flowering staff I have shown a winged staff to suggest the heavenly guidance that both prophets received. They both hold the staff although each technically had their own they both had powers through their staff from Allah (s). Hand gestures in Egyptian art help to tell the story so here I have one prophet praising or offering the staff to the other as they shared their prophethood.